It would be wonderful indeed, if, for every lock, there was a key. Just occasionally the need arises in our household for a key which is not there. At times such as these we head for our box of keys: a motley jangling casket of possibility; old brass worn ancient keys, brand new stainless steel keys; small ones, big ones, spindly ones, ones with a name on, ones with the inscription worn away by decades of fingers fumbling for a lock. The romance of a key is in part because it was made for a lock, and somewhere there is a door or a cupboard or a casket which must forever remain a mystery because its key is estranged. Room 113 of the Victoria and Albert Museum, the longest gallery in the establishment, contains some of the most fairytale keys one night imagine. Do their boxes or doors still exist? Or have they been consigned to history, their keys mourning their demise in silence? They are a lost story; or perhaps an incomplete one. And somewhere, out there in the London melée, boxes await, without their keys. Most of them are great gallumphing oak chests and suchlike. But there are a few which are the stuff of fairytales. I was wandering in the Ancient European section of the British Museum, camera in hand, when I snapped a box which, were I of criminal extraction, would not be there any more. A perfect ancient box, it sits on a pedestal with a filigree lid and the inscription of two wide-eyed angels which hail from another time all together. From one side hangs a bell. On the other is the holder for a long-lost bell which will never jingle again. Seduced by what was to come further into the gallery, I neglected to note its provenance. And now I find myself obsessed with it, and the story I do not know yet. Is it holy,from a church? Did it ever have a key? Maybe one of you can help me: or maybe I will just have to go back, very soon, and find out. I wonder if this fascination with keys and boxes is an eternal tease. Pandora could not resist, and neither can any of us. And the Brothers Grimm used the box and the key as their final, ultimate tease, in the closing pages of their iconic fairy tale book. The Golden Key was added as tale no.161: the final one in their second edition in 1819. In the frozen wastes of winter, there was a small boy: and as was often the custom in times gone by, he was sent out with his little sled to go and fetch firewood. He worked hard and became chilled to the bone; so that, rather than go straight home he resolved to light a fire then and there. An as he scraped away the snow to make a start, what should he find but a glorious golden key. “Ah,” thought the little boy: “where there is a key, there must surely be a box!” And sure enough, after searching a little while he found a stout iron casket. “This is too good to be true!” thought the youngster. “Surely there will not be a keyhole?” And after searching for a long while he found it: a tiny key hole, very hard to see, but just the perfect size. He tried the key: and it fit, snugly, as if the lock had been waiting for its key all the time. What a satisfying little clunk it made, as the key turned the beautifully crafted lock! And now (continue the Grimm Brothers) we must wait until the little boy has finished opening the box. Then we will hear of the wonders inside. And there the story finishes: a story without a well-fitting end, a key without its lock. Posted in Folk tales, London, WhimsyBookmark the permalink. Cool keys. It is amazing that they are so ornate. I hope you’ll have the chance to go back before long and find out more about that wonderful little box. It is quite exquisite! And the keys are beautiful. My mom has collected keys through the years, and many of them are very ornate and special. I think they’re all just collected in a box and you’ve made me think of them and wonder if they might one day be on display somewhere. They are of a vintage that is rarely seen any more! You make me wonder if someone out there still makes beautiful keys, Debra…I’d love to see some of your Mum’s collection! I seem to collect keys, none of them as ornate as the ones depicted, of course. It is a strange habit to hang on to keys, even if you have no idea where they fit. There is certainly magic in keys…. There are a lot of old keys in the various drawers of this old old house but I don’t know what they open! That’s the story of many old houses, I’m sure, Julie! Only recently, on Antiques Roadshow, they matched a two key to an ancient strong box that had not been opened for centuries. On opening, the chest was found to be empty – save for a red Biro top. Yes, I saw that too, it was disappointing – I do not think that it was centuries – red Biros have not been around that long!!! Now you mention it, I remember it going on in the background as I pounded the keyboard. A red biro top.Anticlimax…. 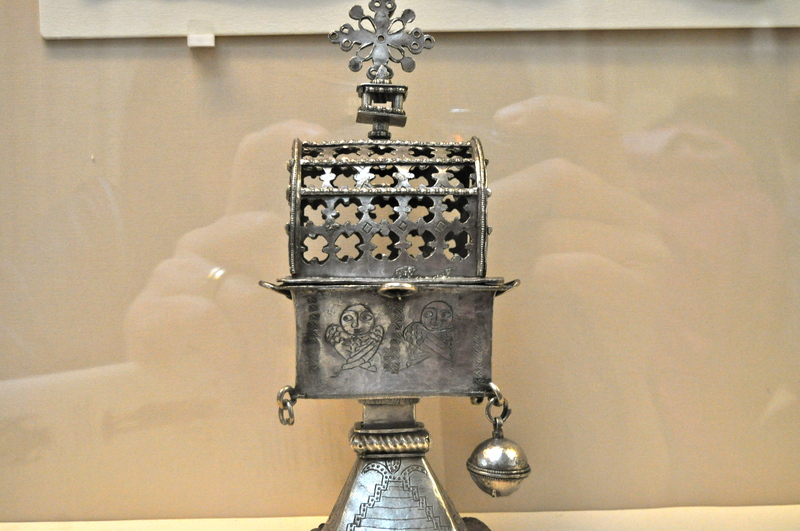 The box in the British Museum is a Censer – for burning incense. There are pairs of angels on all four sides with their wings crossed in front of them in fear of divine glory. It is 18th century and was made in Ethiopia and was acquired from Sir Stafford Henry Northcote, 1st Earl of Iddesleigh – don’t be deceived into thinking that I have all of this information at my fingertips – the internet is such a useful tool. Thank you Rosemary: you’re a better searcher than me, however did you find it? The bells should have given it away, I suppose. Must go back and say hello to it sometime. I suspected that it was a censer so put that into the British Museum website. The keys are gorgeous and makes one wonder exactly what lovely object they are intended to open. I have old keys, none ornate, unfortunately; that seem to stay with me long after their usefulness has expired. I just look at them and think there must be some future use for them; perhaps I am harboring a pack rat mentality and just blissfully unaware. No, I’m just the same, Lou. I cannot throw away keys. I harbour this feeling that tomorrow I shall need one of them. Old and rustic and yet have a charm. I am sure the locks would be amazing too. They must, mustn’t they, Jas? Hmmm. I needed a plastic food storage container last night. Fiddled about the lower cabinet and, of course, everything but what I needed fell out. Oh well, perfect time for cleaning the cabinet, employing Tom to get down and reach way back. Out came all sorts of things I didn’t know I was missing from the drawer above – including, are you ready?, keys! No idea what they are to, certain they do not open treasure chests, and absolutely sure they do not resemble these intricate beauties you share, Kate. …and I’ll wager you didn’t throw them away, Penny 😀 I bet they’re filed somewhere in a little box, just in case? Yep! Right now, they are on the countertop where they will languish until one of us throws them into the same drawer they started from, only to be rediscovered next Thanksgiving. You must go back and give us an update, Kate. Those locks and keys are lovely. They don’t make them like that anymore. Now one gets a plastic card at a hotel or a keyless remote for their car. The old crafts were rather lovely, weren’t they, Carrie? Hi Jillian! Enjoy Room 113. A a key lover, you will be in heaven. I wonder if you will find other beautiful antique keys to add to your collection? My recipe collection is stored in just such a box. Key at the ready. That’s a good idea, Nancy! Looks nice, and practical too. I wonder if the owner of the V&A keys adopted the same strategy? Wonderful, Kate. You had me traipsing right along with you down the labyrinth … and, now, I’m wondering how the little boy’s story ended. When I was little, I had a skeleton key. Marvelous thing. It fascinated me just like the tales you weave. Grimm has been leaving people hanging in the middle of a story for almost two centuries, Judy…maybe it’s time someone wrote an ending. Thanks, Barbara! They do stir up the writer in us, you are absolutely right! Lovely blog. Keys do hold a kind of magic. Where I work – Regency building in Cheltenham – there is one original key to a cupboard which is large, ornate, slightly bent but as smooth in the lock as when it was brand new in 1811. What a lovely introduction to you, Kate! We were nominated by Madhu in the Booker Award long ago and I’m just getting to check the 2 blogs I didn’t know, and say hi! The V & A is the most wonderful place to wander. How many stories must have come out of it? I love this. Those keys are really magnificent Kate. I have a jar in my pantry of keys that we find. While none is even remotely close to the beautiful ones that you have shown, I’m mystified at how we have so many and that we do not know what they open.